The road work on highway 319 has affected almost every resident of Wakulla County. Pastures, timberland and even a few roadside stores are now in the process of being converted to a speedy route to the coast and Tallahassee. The disruptions and longer commute times are temporary and can be chalked up to progress. Long time residents will reminisce about how things were different in the 1960’s, 50’s or earlier, but life in the 21st century will continue to see many changes, positive or negative depending on one’s perspective. Curiously the roadwork has unearthed evidence of a very different Wakulla County still present today, but rarely recognized. All one has to do is look at the boulders and rock turned up for the confirmation of a time before human occupants arrived. 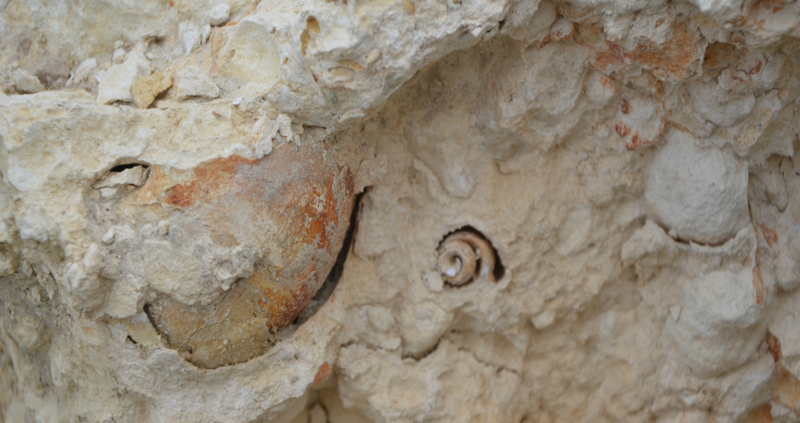 The unwritten history of north Florida is recorded in the fossil record of the area’s limestone and with relics often darkened by tannic acid from trees. The remains from this prehistoric era are not dinosaurs which were long gone before many of the area’s fossils were produced. 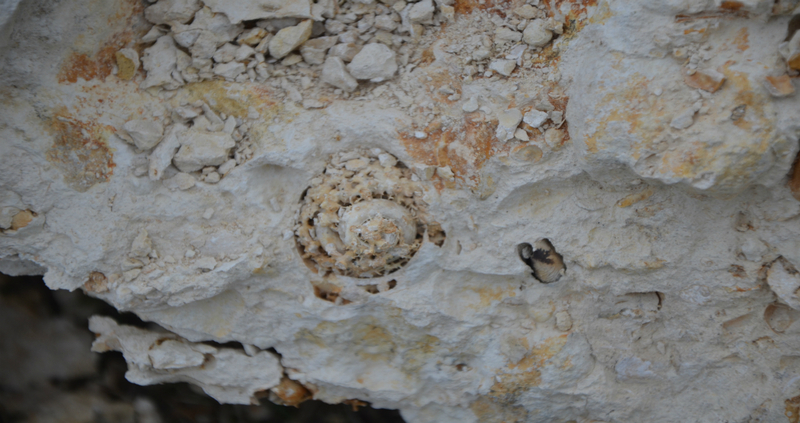 Recently unearthed limestone has the record of life in Wakulla County in the epochs long before people arrived. From a geological standpoint, the Florida landmass known today is a very recent occurrence. It is thought glacial activity caused the Gulf of Mexico to retreat several time exposing what would become Florida during the Pliocene Epoch. The development of fossils was aided by environmental factors present at the time. First the area was geologically tranquil for 25 to 30 million years. While Florida was submerged the shallow bays became stable collection points for the remains of sea-life which was buried. The ebb and flow of tides covered and preserved the hard tissues which were calcium based. Once the retreating sea left dry land, no mountains were pushed up by subterranean plates which would have changed rainfall patterns or caused rushing waters. The steep inclines and scouring water movement would have removed the potential fossil remains. There were no volcanoes which would have covered large areas with lava and ash, deeply burying anything on the surface. Nor were there earthquakes which would have dropped large chunks into the gulf. Limestone deposits close to the surface also aided the process. Over time some of the deposits dissolved and produced caves and sinkholes which are still evident today. Animals became ensnared in these natural traps and, over time fossilized. Their hard tissue was preserved along with rare examples of tree bark which absorbed minerals as the cellulose dissolved. If the long term conditions were suitable, the shell had a high concentration of calcium carbonate it could survive to the present. If not, then only the imprint had the potential to last. Shark’s teeth are the most commonly encountered Florida fossil. In many cases, only the tooth’s color has been changed and it is still as sharp as when the sharks were using them. Shells and shell imprints, sea urchins, and bones from fish and marine mammals are also in the solidified mud from a distant time. Most are broken, but occasionally a complete specimen is encountered. It is ironic how contemporary events confirm the philosophy that the only thing constant is change. 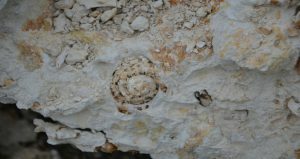 To learn more about geology and fossils in Wakulla County, visit the UF/IFAS Wakulla County website at http://wakulla.ifas.ufl.edu or call 850-926-3931.